In October 2000, at the age of twelve, I sweet-talked my father into buying me a copy of Ultimate Spider-Man #1. The issue’s writer, Brian Michael Bendis, meant nothing to me. He was an unknown. That changed thirty pages later. From my earliest days I understood the compartmentalized process involved in creating comics, and could identify respected artists and writers, and even inkers on occasion – but my purchasing decision was never based on who was responsible for the product. I bought everything Superman, Batman and Spider-Man, and that was that, no questions asked. But something changed with Ultimate Spider-Man #1. Bendis’s storytelling choices, his back-and-forth dialogue, resonated with me, as it did with the vast majority of fandom. From that day on, I made it my mission to read everything Bendis published, and continues to publish. Much like Greg Rucka and Ed Brubaker, Brian Michael Bendis played an essential role in my formative years as a storyteller, and as a storytelling connoisseur. And now he has written a book on writing comics. With WORDS FOR PICTURES, Bendis has created the ultimate writers’ resource. A one-stop-shop for aspiring creators, and those already heavily vested in the craft. And even those without the slightest creative inclination will find Bendis’s exploration of the process captivating. 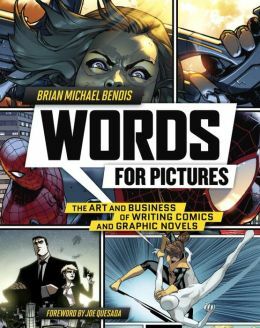 WORDS FOR PICTURES isn’t just a ‘How-To’ guide; it’s littered with interviews with industry professionals; writers Ed Brubaker and Matt Fraction; Marvel Comics editor Steve Wacker; artists Mark Bagley, Michael Allred and Chris Bachalo; and that barely scratches the surface. It might be Bendis’s name emblazoned on the books cover, but this book isn’t an insular breakdown of the process; it encompasses a grand selection of industry professionals, and the book is a greater resource because of this. What is the Marvel Style scripting method? What’s the best way to foster a relationship with an artist? Bendis answers these specific questions, and more, but also offers his thoughts on grander subjects; why do we write? How can you identify an idea as good or bad? It’s in these moments, when Bendis extrapolates his own opinions, that WORDS FOR PICTURES transitions from writers’ toolbox to writers’ inspiration. This is a guy who has been writing comics professionally for almost two decades now – how does such a prolific creator retain his passion and determination? And what can we, as writers aspiring to match his exploits, from him? There are several comic book writing resources available for ambitious creators, but few can match the star-power and comprehensive content offered in WORDS FOR PICTURES. This is the kind of resource that’ll sit on my desk for months; something I’ll return to, frequently, for intermittent moments of motivation and encouragement. In WORDS FOR PICTURES, Bendis tells it like it is; there are no guarantees in any creative industry, and he acknowledges working within its confines is rife with failure – but after reading it, I’ve never been more determined to succeed.